Measure water usage: You have to track the amount of water you are using in order to begin managing and conserving this resource. It should be as simple as checking the water meters at your pump stations, recording and adding them together. You will want to know how much water you use overall and then you will want to check daily to get an idea of your usage in 24 hours. This will be the first step in conserving and managing your water use properly. Avoid compacted soil: Soil compaction increases surface runoff because when the soil is very dense it becomes less able to take water in. Whenever you aerate your soil with slicing tines or blades, you significantly reduce the compaction, allowing for the water you use to go farther. This means more bang for your buck and less water wasted. 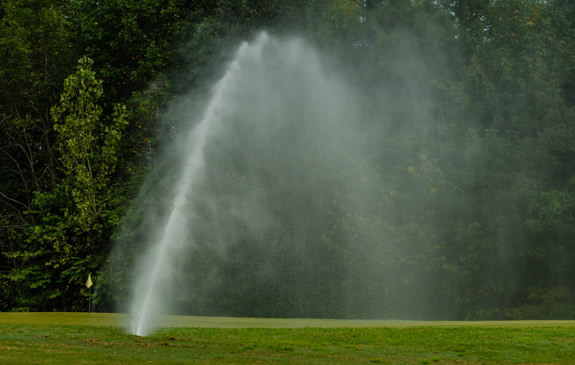 Use of wetting agents: Wetting agents can help your efforts to conserve water because they help improve water penetration into soil, making the irrigation more efficient. Wetting agents have been proven to help retain high levels of moisture in your soil, which will go a long way when conserving your water usage. Soil moisture sensors: Using in-ground sensors to determine the moisture levels in your soil will help you to put the water where you need it the most. These sensors assist in ensuring you are not overwatering or underwatering any part of your golf course. This will go a long way not only in conservation, but also in preserving the health and beauty of your golf course.